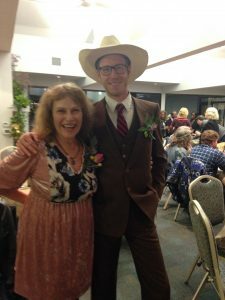 So our tribe of 3, representing Oasis Community Farm just outside Petaluma, attended the FIFTH Annual Farmers Guildraising, this time held on campus at UC Davis College of Agricultural and Environmental Sciences – and it was all it was cracked up to be. Real solutions to farming challenges, great networking, fantastic dance band! Make-your-own corsages with amazing flowers and cotton balls (you could PLANT the seeds!) Simply wonderful all day and night event. Thank you, Farmers Guild/CAFF and especially Evan Wiig, who has so much energy and talent I had to tell him many think he’s brilliant – and he looked SPIFFY in his playful Man-in-the-White-Hat suit for the Agrarian Lovers Ball end of day. We loved exploring the gardens and farm buildings, meeting the people who run them, learning in the various workshops what works across the country to support small and usually organic – farms. The takeaway: we have a mountain to climb to keep small farms healthy – and together we can do it! Example is the collaboration between Bi-Rite Grocery, SF, and Oak Hill Farm, Glen Ellen, among others, bringing Sonoma County flowers and veggies twice a week during heavy production and keeping this 50-year old farm in fine fettle – even after the fire burned down some buildings! So who’s your grocery outlet or restaurant customer? Farms here need all the tools: Community Supported Agriculture (CSA boxes delivered or picked up), Farmers markets – AND grocery or restaurant buyers as well as farm stands or other tools you create. Stay flexible! The combination will be challenging but doable, is what I hear. The guys from Bi-Rite, San Francisco, Sam and Rich, were keynote speakers and they told us they love small local farms, are dedicated to working with local local local instead of Mexican or wherever else Sprouts gets their “organics”. Please. Really? “Bi-Rite is a neighborhood market,” says their site, “feeding our community with love, passion and integrity.” Sam and Rich are spoke about relationships and love – as if we fall in love in order to raise vegetables? Well, not so far wrong. It does take a village or tribe to keep the farms together and new ones are forming! Bi-Rite considers itself to be the “Chez Panisse of grocery stores” and strives to get average farmers atuned to food as a source of health. A great threat they see: we’re not cooking as much and the trend to buy delivered meals is also coming on. We can approach farming from a hi-tech vertical farming practice but whatever approach we take, we must rebuild the soils of our country for future use. And they say, we need more animals on the land. So – work with soil; shift consumer mind-set are two principles for Bi-Rite guys. Another concern – and hope – is how millenials view food. A study showed millenials want to support companies with principles so you don’t get co-opted by the big guys. Don’t be afraid to be teachers, say Rich and Sam. Learn as much as you can and weave it all into the story we tell. The most important element in success, they say, is love and trust. Thanks to Evan and friends, Amy and who all else put in place an “Inspiration Station” where people could list their desires and offers. Turned our our barn manager, Steve Lewis AKA Rama, had a meditation group to lead mid-day so he took the car leaving us without a ride to the Agrarian Lovers Ball, but a note on the board got us carpooled in minutes with patient people who put up with us not getting where we were to meet on time! Whew. Example of sweet people together – we ACTUALLY help each other! Dinner fare was delectable (of course!) and included both short ribs and lamb along with delish veggies. Glad our barn manager, Rama, arranged an AirBnB for this junket. Inexpensive, close to campus and Continental breakfast (bad coffee, fruit and artificial cream!) Ah, well, it was a fine trip for good reasons and now to work on the principles. Very much looking forward to working closely with Farmers Guild – and attending next meetings and Guildraising!